I am here today to join the multitudes commenting on the loveliness that is The Sprouted Kitchen, a new cookbook written by Sara Forte and photographed by her husband, Hugh. They are, of course, the couple behind the blog of the same name, which I’ve read for quite some time — long enough that I don’t recall when or how I found it, though it must have been within its first year of existence. What I do remember is the way I poked around upon the discovery, reading back through the blog’s archives and clicking through its links. Sara’s voice was lovely and honest; her words resonated with me, and she made the sort of food I love. And the photographs! They were gorgeous, with angles and artistry that set them apart from the food photography often replicated around the web. And so I have followed the blog — and in turn, Sara and Hugh — for these years since, and those first observations still hold. Last Sunday, I was thrilled to find myself sitting in front of them (in the bookstore of the food lover’s dreams, no less! ), listening to them tell their stories and talk about the recently published book. They are just as authentic and lovely as they seem online. If I hadn’t already been a fan, this would have done the trick. Sara commented, as she had on her blog, that when the opportunity to write this book arose, she wasn’t sure she was ready. It seems she’s a planner, and a long-term thinker — and oh, these things I surely understand. But the cookbook she and Hugh created is evidence that sometimes we are more than ready for the tasks that intimidate, the ones our doubting hearts say we shouldn’t tackle. It was a good reminder for me. And their trust in one another was another good reminder: I can embrace the encouragement I find in my own partnership. I still find myself thinking that I have to go it alone, but I don’t. In the midst of this crazy season, I needed prompting to recall these things. So many thanks to Sara and Hugh for all of that, and for their beautiful cookbook. 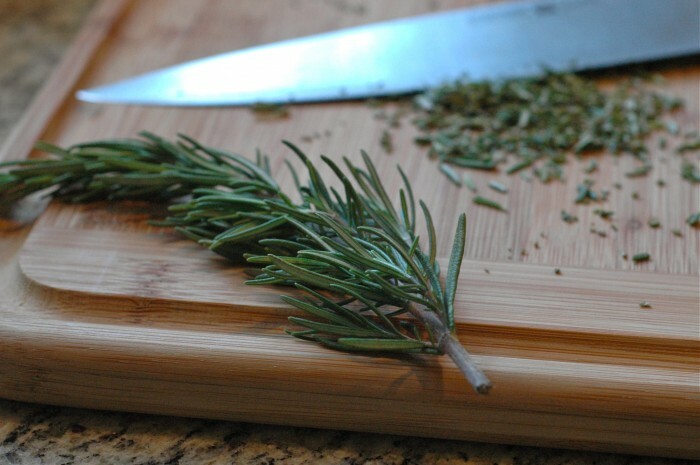 Ben and I have a bit of a thing for rosemary, and I have a bit of a thing for food encased in a cute (i.e. 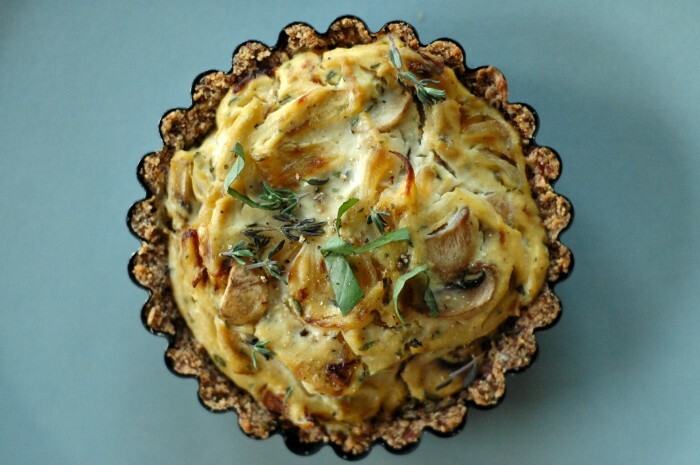 little) vessel, and so the recipe for individual tofu and mushroom quiches baked in almond and rosemary crusts quickly caught our eye. These would be a fitting contribution to your next brunch gathering, or an excellent centerpiece for a lazy weekend breakfast. However, I got the book on Sunday afternoon, my husband has an extremely early commute and I was not about to wait for the next weekend. And so I am here to tell you that these also make a delicious weeknight dinner, served alongside salad and bowls of soup. And maybe a couple of beers. 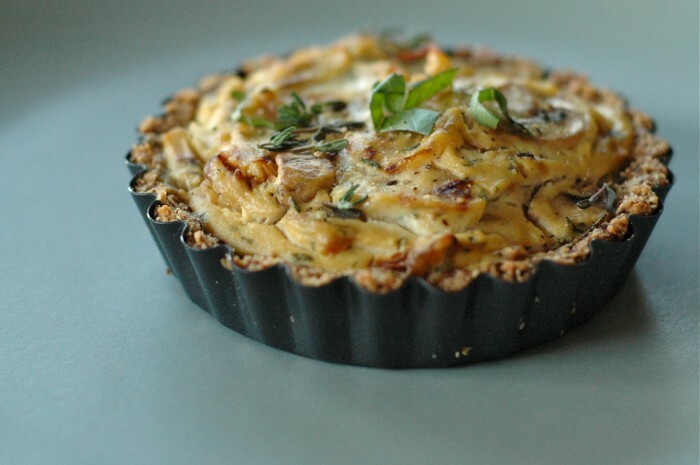 I am also here to tell you that these darling quiches are, frankly, AMAZING. The crust, sandy and crumbling, is countered by the creamy filling; the contrast of textures is just right. And on top of that, these little beauties are free of gluten and dairy — and they are terrifically healthful whether or not you are avoiding such things. …which are baked to a toasty golden brown. In sum: Make these. Buy the cookbook. Be encouraged. As we in our household are not avoiding dairy and I have not yet invested in coconut oil for the new kitchen, I substituted butter in the crust; it worked out just fine. Note also that in lieu of purchasing almond meal, you can pulverize almonds in a food processor. 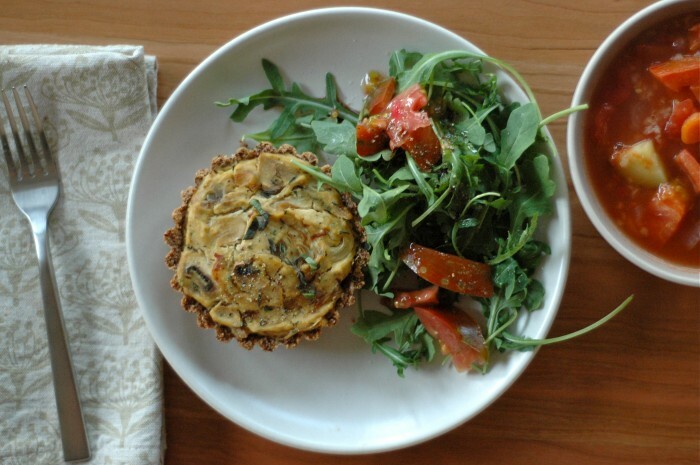 Sara explains that if you’d like to make one large quiche in a standard pie pan, you can do so by increasing the amount of each ingredient by 50 percent and adding 10 minutes to the final baking time. Preheat the oven to 375 degrees. 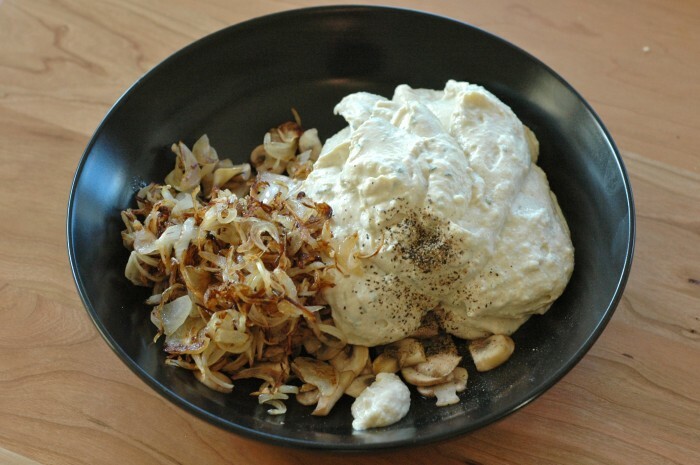 Wrap the tofu in a few layers of paper towel to absorb the excess moisture; place it on a plate and set aside. 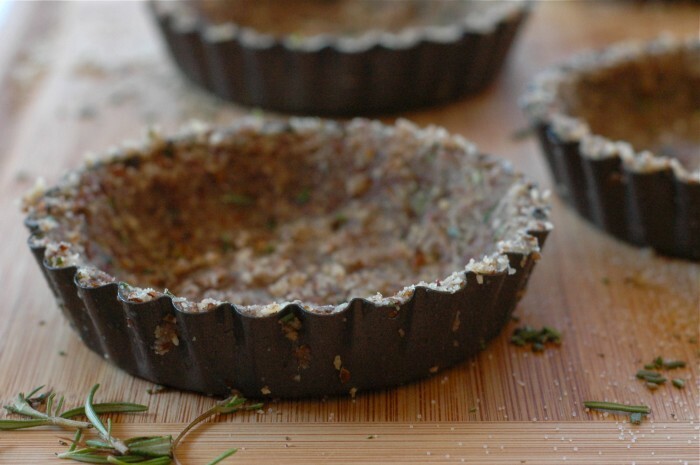 To make the crust, in a medium bowl, combine the almond meal, salt and rosemary. Add the water and oil (or butter); stir until thoroughly combined. The dough should be wet and a bit crumbly. Divide the dough equally among four 4-inch tart shell pans and gently press the dough evenly against the bottoms and sides of the pans. Bake 10 to 12 minutes, or until the tarts look dry and just toasted. Remove and cool on wire racks, leaving the oven on. To make the filling, heat 1/2 tablespoon of the oil in a saute pan over medium heat. Add the mushrooms and a pinch of salt. Cook, stirring, for 6 to 8 minutes, until the mushrooms are browned and cooked through. Transfer them to a medium bowl and set aside. Add the remaining 1/2 tablespoon oil and the onion to the pan. Cook until just caramelized, about 15 minutes. 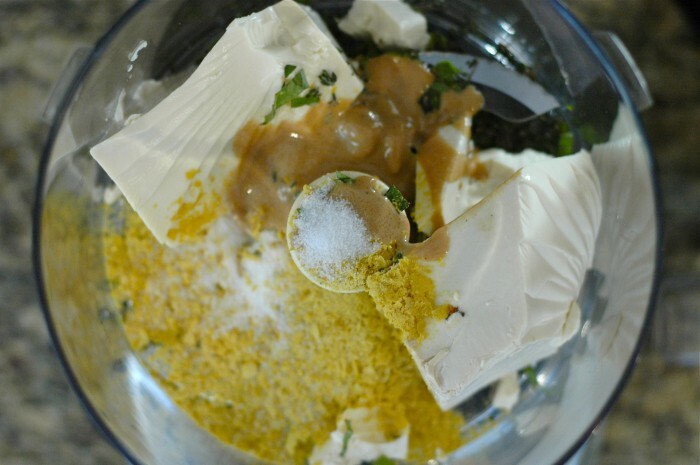 In a food processor, combine the drained tofu, nutritional yeast (or Parmesan), tahini, herbs and 1/2 teaspoon salt. Pulse until smooth. (Alternately, use a potato masher or fork in a bowl.) Add the mixture to the mushrooms. 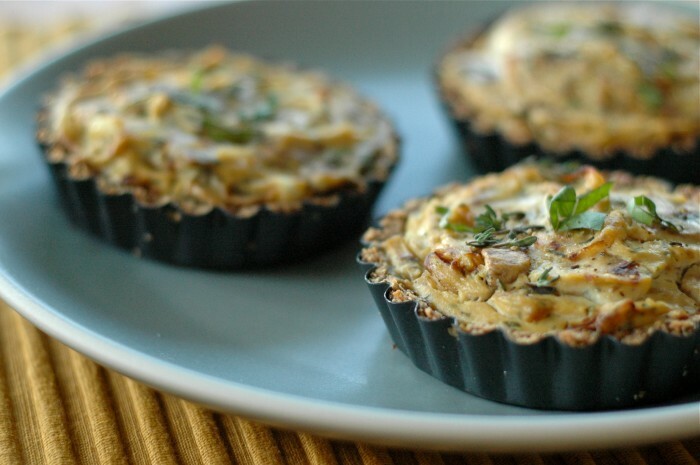 Divide the filling among the cooled tart shells. (You may have a bit leftover, as I did.) Put the quiches back in the oven and bake for 20 minutes, or until the tops are slightly browned. Remove and let cool. 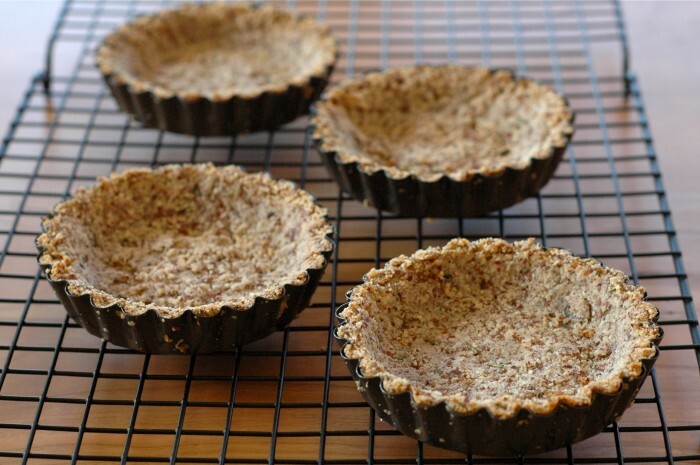 Carefully remove the tarts from the shells (the crust is very delicate). 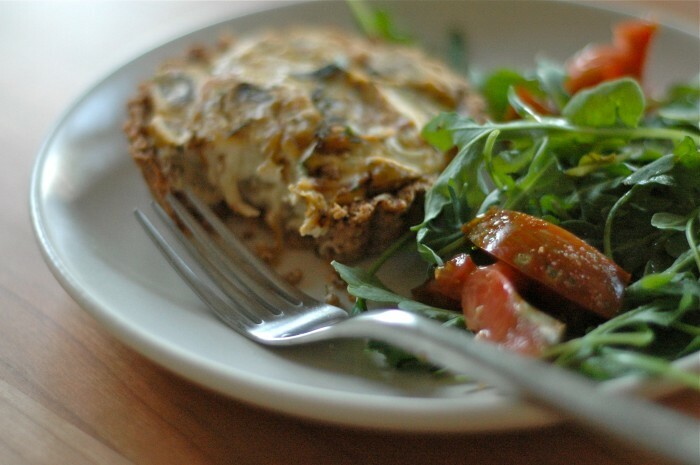 Top with more fresh herbs, and serve warm or at room temperature. Thank you, Kasey. I agree — I don’t want my poor little tart pans to go unused! Really lovely to meet you as well; I hope we cross paths again soon! You’re so sweet. You are most welcome! I must say, as one who has just moved to California from Michigan, you don’t seem THAT far away. ;) So perhaps our paths will still cross again. And yes: I’d love to hear about that little tart sometime!